Memphis 901 FC and Nashville SC fans will meet for the inaugural Tennessee derby on Saturday at First Tennessee Park. While Memphis 901 FC has had an up-and-down start to its inaugural season, the one constant over the opening six weeks has been the club’s support at AutoZone Park. Over 7,000 fans turned up on Wednesday night to cheer on the expansion side in its USL Championship Game of the Week on ESPN appearance against ATL UTD 2, which ended in a 1-0 victory for the visitors. While the result was a disappointing one for Memphis as it held the majority of possession and recorded nine shots on target to Atlanta’s three, 901 FC players and fans won’t have to wait long for another moment in the spotlight. A trip to in-state rival Nashville SC for the first Tennessee derby of the season beckons on Saturday night and the Bluff City Mafia – Memphis’ official supporter’s group – is ready to hit the road. 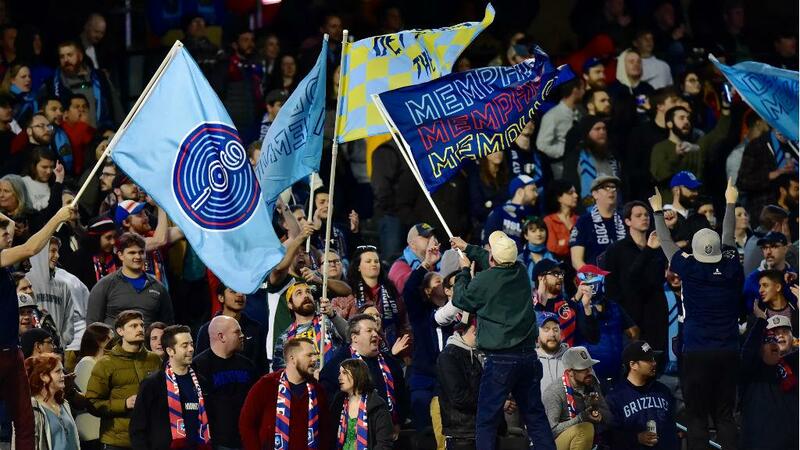 A group of about 100 fans from Memphis 901 FC supporter's group the Bluff City Mafia will make the nearly 225-mile drive to Nashville this weekend for the inaugural Tennessee derby. After the group completes the nearly 225-mile drive east on I-40, the plan is to meet up with Nashville supporters for a good old-fashioned southern tailgate. France says NSC supporter’s groups the Assembly and the Roadies have reached out about hosting them and that they are still in the process of finalizing their exact plans. “We do soccer a little bit differently,” said Newton Dominey, President of the Roadies. “In Nashville we welcome other supporter’s groups into our pregame and want to have a lot of fun with them and show them that we can be welcoming, hospitable and then let’s go duke it out for 90 minutes and then let’s go drink a beer and talk about it after. While there will be a certain measure of southern hospitality about the pre-match proceedings, there’s little to doubt about the rivalry between the two cities. 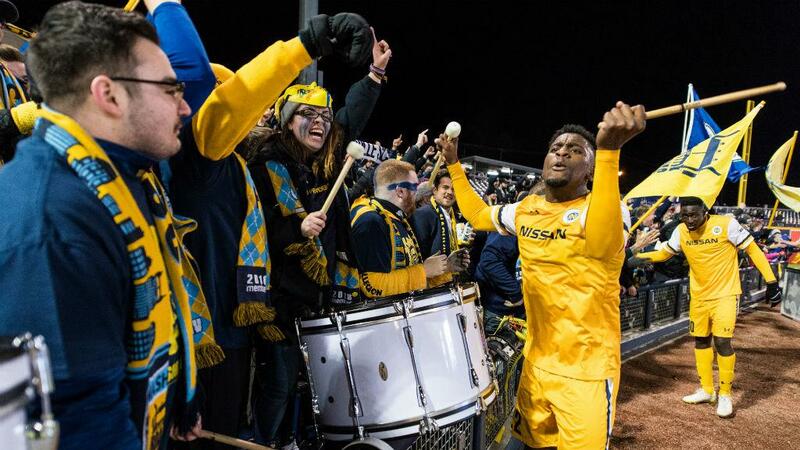 Nashville SC defender Bradley Bourgeois bangs on a drum with fans after his side's 2-0 home victory over the Charlotte Independence last season. “A lot of it is regional. It is kind of the two big cities in the state and for a long time, Memphis was actually the capital of the state,” said France. “And just over the last decade or so – maybe a little bit further past that but not much – you can kind of see the two cities start to trend in different directions. Given these differences of opinion, it’s no surprise that there has been plenty of trash talk to go around in the lead-up to Saturday’s contest. And it hasn’t just been between the fans taking part. 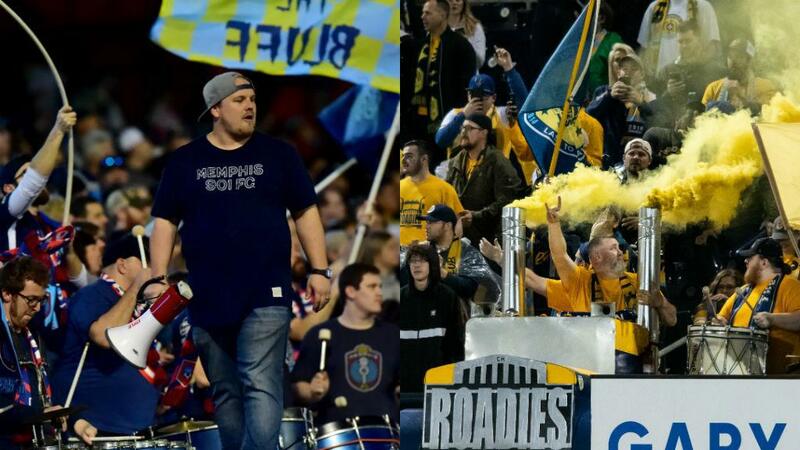 Both Nashville SC and Memphis 901 FC have engaged in their fair share of banter on social media in recent weeks, with neither team backing down from the other in the online battle for state supremacy. They also both tried to make their mark in enemy territory by buying billboards in the other's community. This joke was in poor taste just like your new logo...and hot chicken. While NSC and 901 FC will meet for the first time this weekend, previous iterations of soccer clubs in the two cities have played in the past. Dominey remembers the atmosphere being “fun” but expects this matchup to mean just a bit more given the circumstances. We’ll have to wait and see just how the game plays out over the 90 minutes, but there’s one thing for sure. You’re not going to want to miss it.